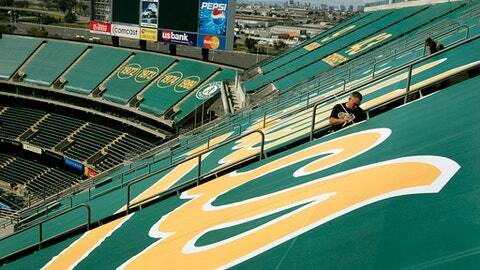 OAKLAND, Calif. (AP) The Oakland Athletics are pulling the tarps and opening a portion of the upper deck at the Coliseum for their upcoming 10-game homestand. The View Level will include 12,103 additional seats, and are to be available beyond this homestand. Tarps will still cover the area known as ”Mount Davis” after it was built for late Raiders owner Al Davis to increase stadium capacity as he returned the team to the Bay Area from Los Angeles in 1995. The seating blocked splendid views of the Oakland Hills.